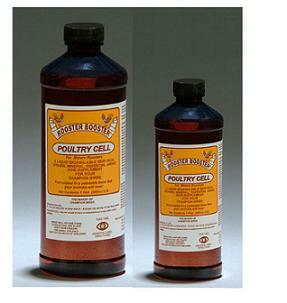 1 bottle of Poultry Cell is a liquid bio-available iron-rich, vitamin, mineral, essential amino acid supplement. Formulated in a palatable base that your birds will love! Rooster Booster Poultry Cell is the new standard in blood builders. It provides vitamins A, D, E and essential B-vitamins, along with 400 mg. of bio-available iron and other necessary minerals per fluid ounce. For use as an oral vitamin supplement. Directions for use: (1 to 3 cc) per day. Poultry Cell may be mixed in feed or administered orally with a dose syringe. I got this product and tried it out on a weak bird I had. Been giving this stuff for about a week and the birds is doing great. I highly recommend this product to anyone. Thanks for the great service.